Q. You left school when you were 13 and traveled throughout the world with your family in the circus. Did you think you’d still be performing 70 years later? It’s never occurred to me not to be performing. My dad worked until his late 80s. He had a dog act, counting numbers, that kind of thing. I guess my family were long-lived performers. Q. What were those early days like? When you start in the circus, you tend to learn lots of things—juggling, horse-riding, stilt-walking, rope-spinning, acrobatics. Eventually I became a wire-walker. I did that into my 60s. I did a couple of Ed Sullivan Shows in the ’60s with dancing and comedy and falling about. They were exciting times. If you go on The Ed Sullivan Show, you know you’ve made it. Q. How did your relationship with Cirque du Soleil begin? I was performing in the opera Carmen on the wire in the opening overture, and while I was in Vancouver in 1986. I was sitting in an apartment and looked across the river, and they were setting up a tent of some kind. I walked over one afternoon, and it was Cirque du Soleil. I got free tickets because I said I was in the circus, went to opening night and was impressed. Back in England I had started an alternative circus, very much like Cirque du Soleil but on a much smaller scale. We had 12 artists, including musicians and my son, Nicky, and daughter, Sally. Sally wrote to Cirque and said if they’re coming to London, we are with Circus Senso. Cirque’s Guy Laliberté and Gilles Ste-Coix turned up in London, came to see the show and came back every night. They asked if we were interested in doing a workshop in Montreal [related to] a production called Eclipse. Production of Eclipse was canceled, but it led to Nouvelle Expérience in 1990. Q. 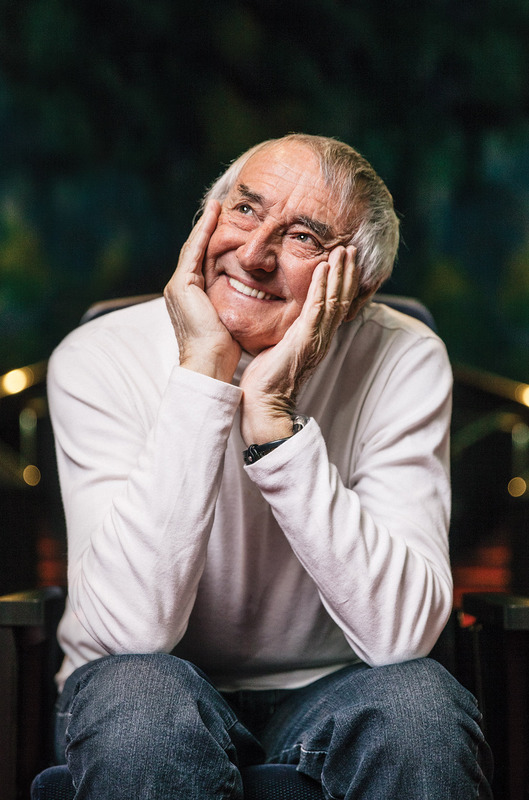 You were the resident artistic director for Mystère when it opened at Treasure Island in 1993, and then for O at Bellagio and other Cirque du Soleil productions. How did you come to be the clown? Being on the administrative and creative side, I wasn’t enjoying it as much as performing. I felt like I ran out of energy and interest . … The [previous clown in Mystère, a friend of mine, got a bad knee injury and wanted to leave. Cirque asked if I would be interested in taking over for him. I said, “Let me try it for a couple of months, and if you’re happy and I’m happy …” That was 16 years ago. Q. How do you maintain consistency yet keep it fresh as an artist all these years? The boredom is getting into the car and coming to work. But once you go through the door at the top of the theater, it’s almost like Alice in Wonderland. You go through that door and “Oh, it’s another world.” It’s fresh, particularly what I’m doing now, because I work with the public and I have no idea what’s going to happen. It’s just so uplifting. You stop thinking about tax returns, all the mundane things in life that one has to do. Q. In the pre-show and as one of the focal points of Mystère, have you had any recent memorable fails? I take somebody out of the audience and put them in a box [so I can] sit with his girlfriend or wife. I got this guy up and he goes, “I’m a bit claustrophobic.” So I tell him “The back is open,” I get him in and shut the box. I’m about to walk away, and he knocks and [pleads], “Let me out.” I got him out of the box and took him back to his seat because I thought he might freak out. I never would have understood this except I had an MRI shortly after. I got into this large tube and got claustrophobic and said, “Sorry, let me out.” I suddenly realized what claustrophobia is. I’ve never had it before and since then, I know what it is. The unpredictability of walking somebody around [pre-show]. I love the moment when they realize I’m not an usher taking them to their seat. We might have walked halfway around the theater and they go, “Why is the spotlight on us?” I enjoy it, and hopefully that communicates to the public that this is fun—I’m having fun, I’m not the suffering clown!